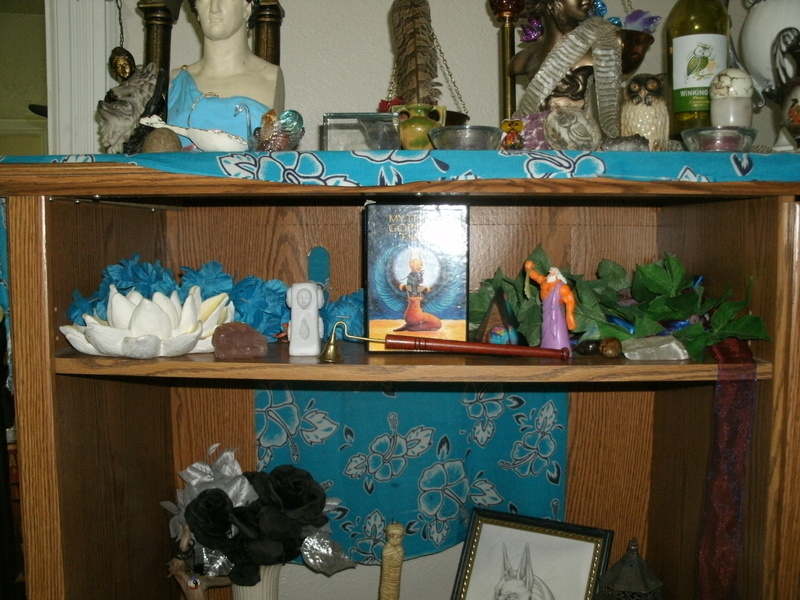 This is the large view of the shrine in the tv stand and the ones on the book shelf next to it. 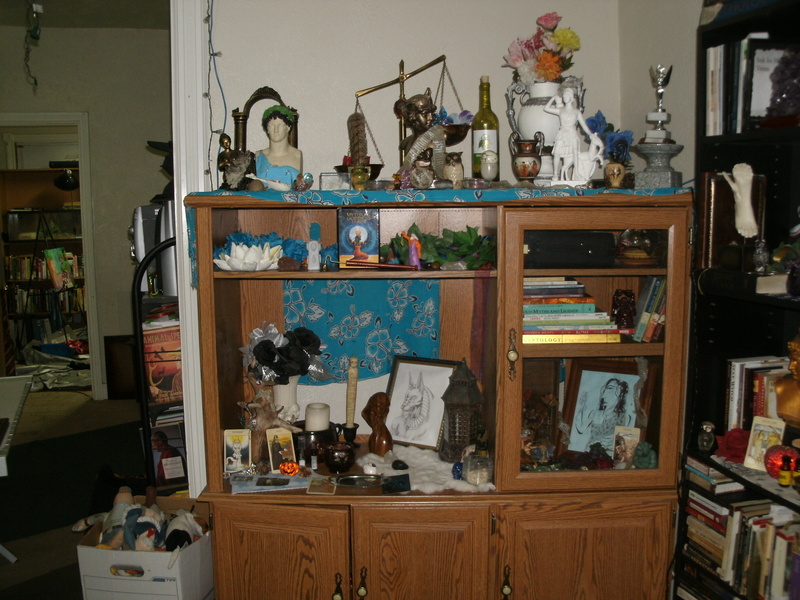 The cabinets at the bottom of the stand are storage areas for tarot cards, incense, seasonal altar decor, drums, and other ritual tools. 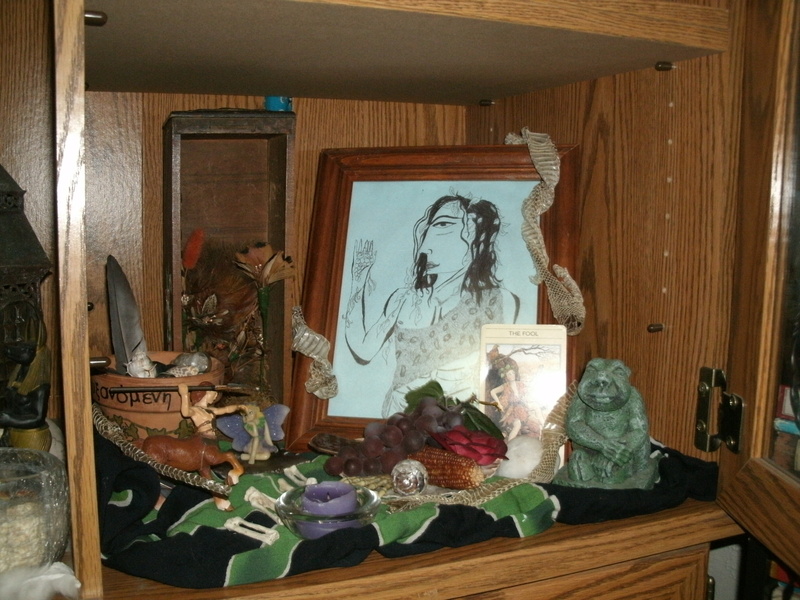 A wooden representation of Persephone and a mummy candle in the middle. 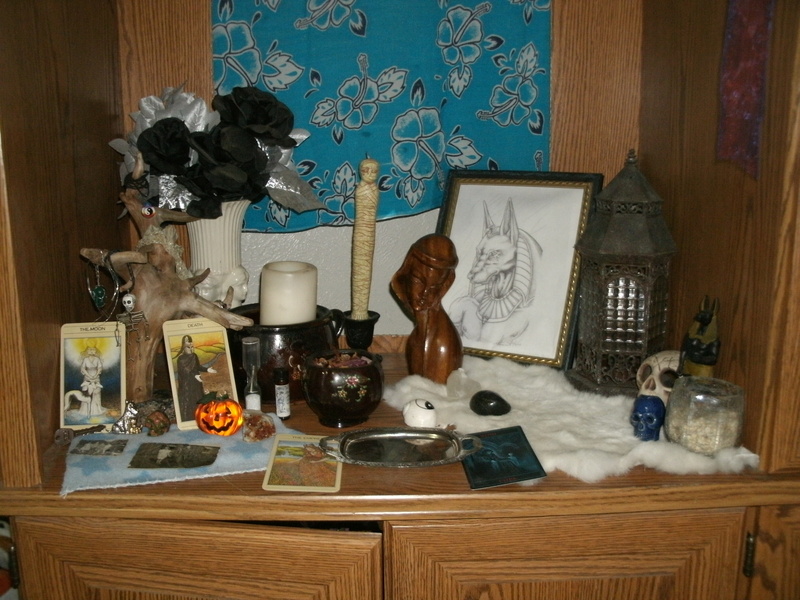 Anubis, Spirit house, skulls, and an offering bowl full of barley on the right. 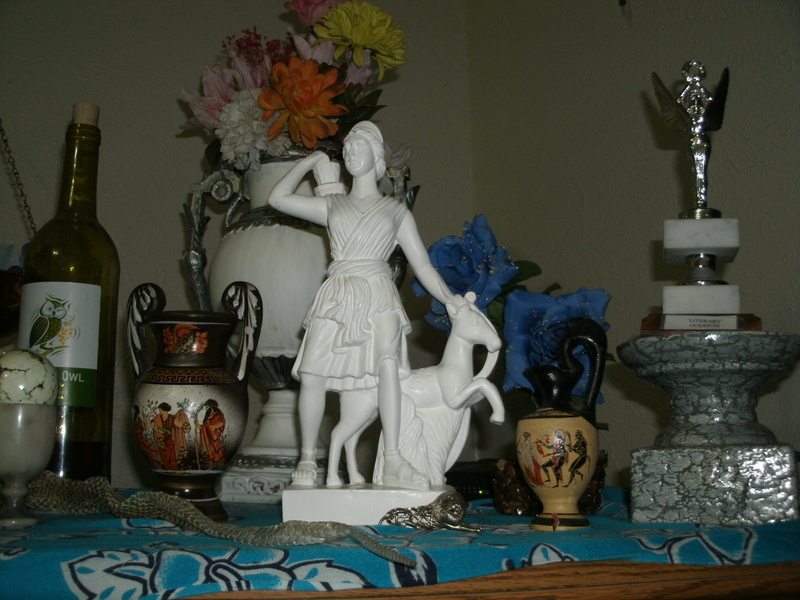 Hades, Hekate tarot card on the left. The tree hung w/ snakeskin, jewelry and stones that belonged to family members (including my father, my soul-mom, my boyfriend, and my best friend of 8 yrs. I don’t have anything to represent my brother yet).a key in front of Hekate, symbolizing the unlocking of secrets, and a dog pin, symbolizing all the pets I have loved that passed (Hekate is closely related to dogs and hounds, as well). The star cloth is the blanket of an orphaned kitten i tried to nurse who died. The small black and white photos are of my grandmother as a child, and the brown bowls were my GREATgrandmothers. On either side of the silver offering plate is a card for Demeter and Hades, birth and death, summer and winter, light and dark. 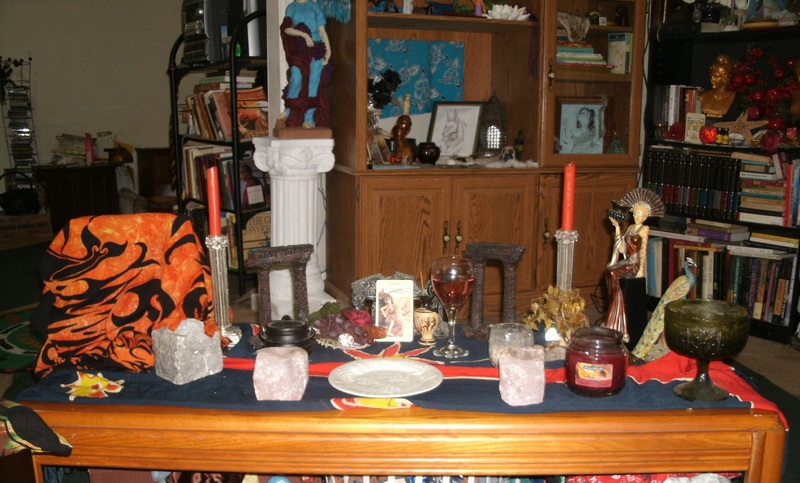 The wooden Persephone is only on this altar in the winter. At the spring equinox she moves to the top shrine to be with her mother. The picture of Dionysos I drew myself. Tarot card is The Fool from the Mythic Tarot. The gargoyle-looking guy is my Silenos, satyr foster-father of Dionysos. Plastic grapes given to be by my old english professor, after i gave her a copy of Written in Wine, a devotional anthology for Dionysos that I was published in. The altar cloth is black & green, colors of earth and foliage. I picked up pretty rocks, one from here in Indiana,one when I was visiting Cali years ago. Can’t remember where I got the Centaur action figure, but I found the picture box at Goodwill, and fairy came from my family store that closed a few years ago. The main Gods honored by this Temple: Athena, Artemis, Apollo, and Isis. Mid shelf. 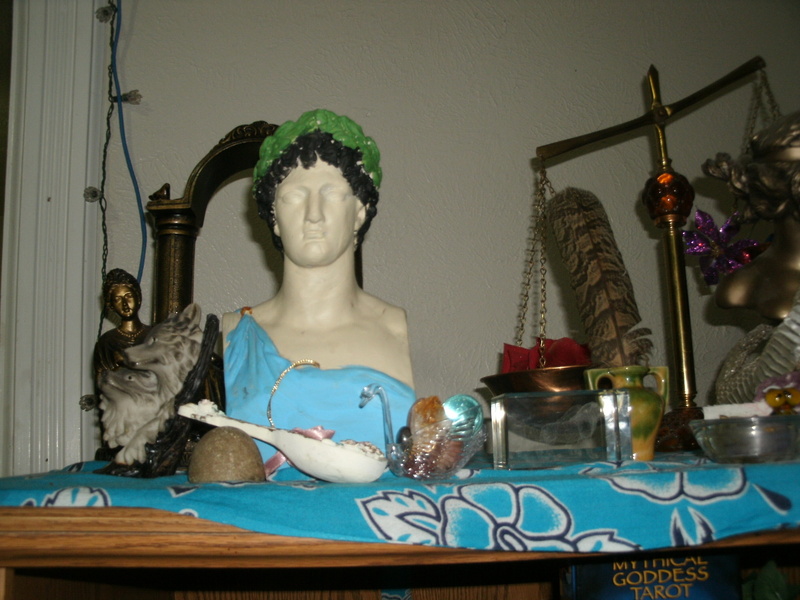 Isis, Zeus, a herm, a glass pyramid with the world inside, 2 ritual garlands, and a large lotus, which symbolizes to me the Eastern/Buddhist influences I will always have, as well as being sacred to Isis and other Egyptian Deities. Apollo closeup. Round stone is the omphalos, navel of the world, at Apollo’s sacred site at Delphi. Lute, God of music. A clear plastic swan (a wedding favor!) filled with stones, and a crystal ball, for clear sight and oracles. 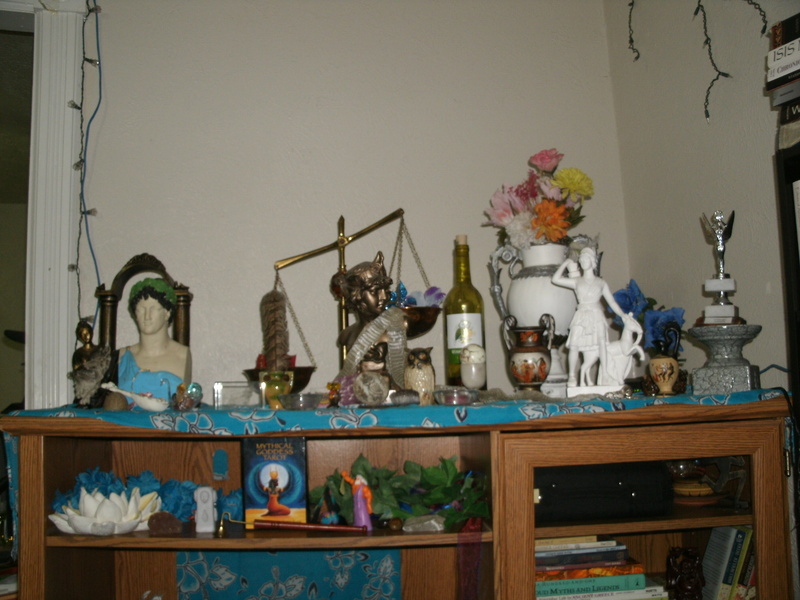 Next to that is a glass block with a lion inside, my astrological symbol of Leo, as well as for Sekhmet. To his left is his sacred wolf, a wonderful spirit of community and wildness at once. Behind him is a Muse playing a lute, for his aspect of Leader of the Muses is my biggest relation to him. Athena, my patroness, my Goddess, my love! 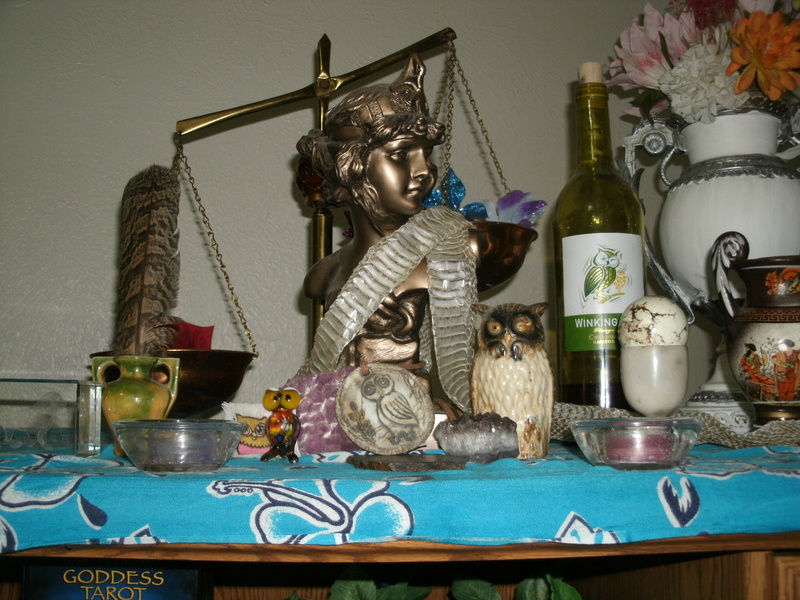 The Scales of Truth sit behind her, the highest one filled w/ flowers, for goodness. Draped with snakeskin, from Medusa, my kingsnake. Fluorite, the student’s stone. Tiny glass owl belonged to my great-grandmother, owl pendant beside it is reproduction of Athenian coin (I believe). A amethyst for psychic power, intelligence, gentle calming energy. Winking Owl white wine. in front of her (can’t see, too flat) is a stone w/ a natural pattern that looks just like snakeskin. Artemis, the Wild Huntress. Small lion pin in front of her, for her aspect of Lady of Beasts. 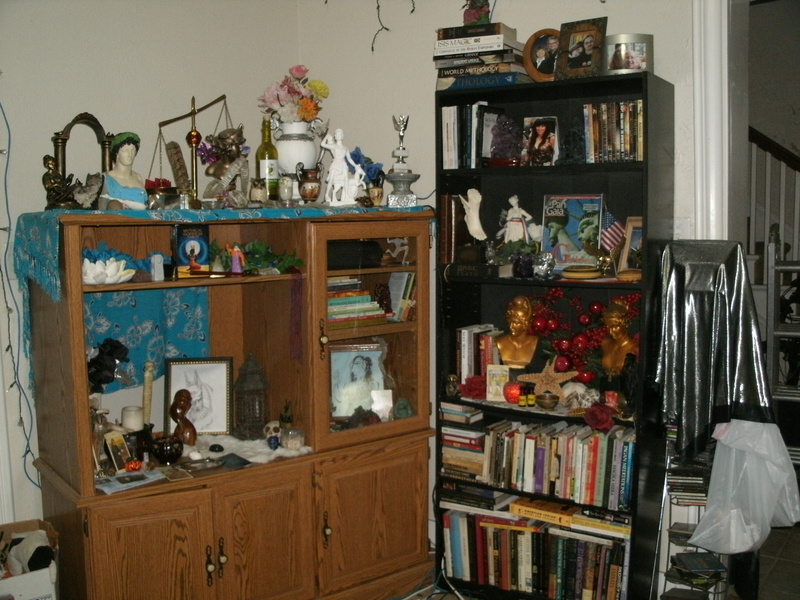 To her left, a large vase from Greece, depicting the sea-Gods Okeanos and Tethys (I think). 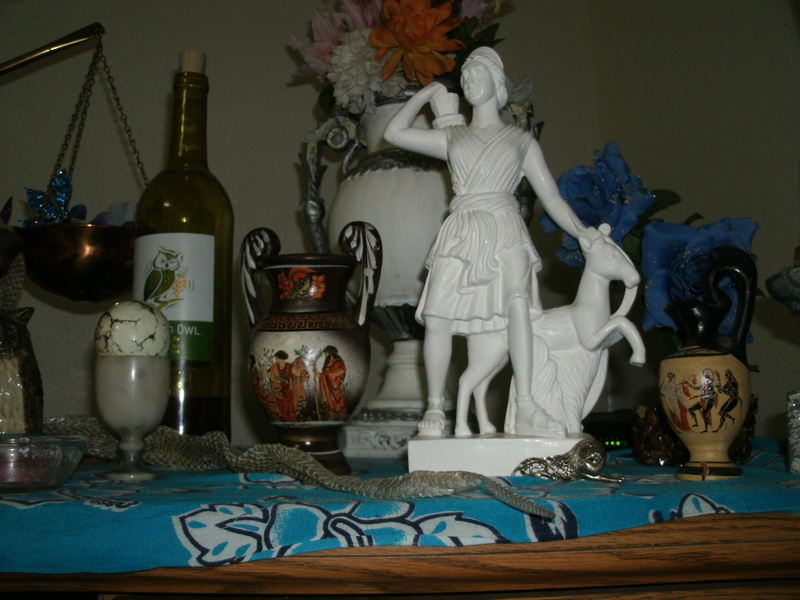 To her right, a small vase from Greece with Dionysos, Maenads, and Sileni. The large urn behind her was a gift from the woman who I consider to be my soul-mother, my dad’s ex, the real mother figure in my life (I love the family connections and memories that many of my altar-pieces evoke). This is kinda silly but I love it. The winged woman on the far right is a cheap plastic trophy that my soul-mom bought for me when my first book was published. She printed the words “Literary Goddess” and taped it to the base. I treasure it greatly and it symbolizes a Muse for me. 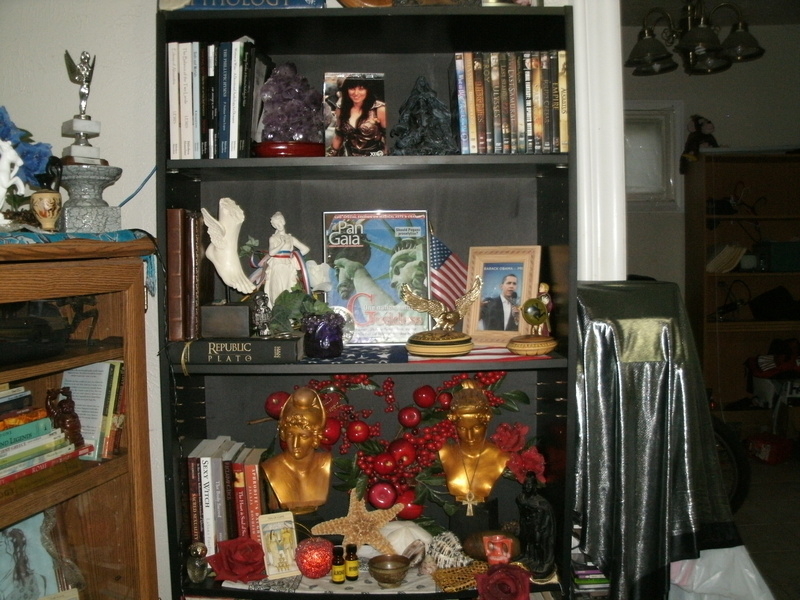 Shelf Altars: at the bottom is the altar to Eros and Aphrodite, with a small Ares besides her. 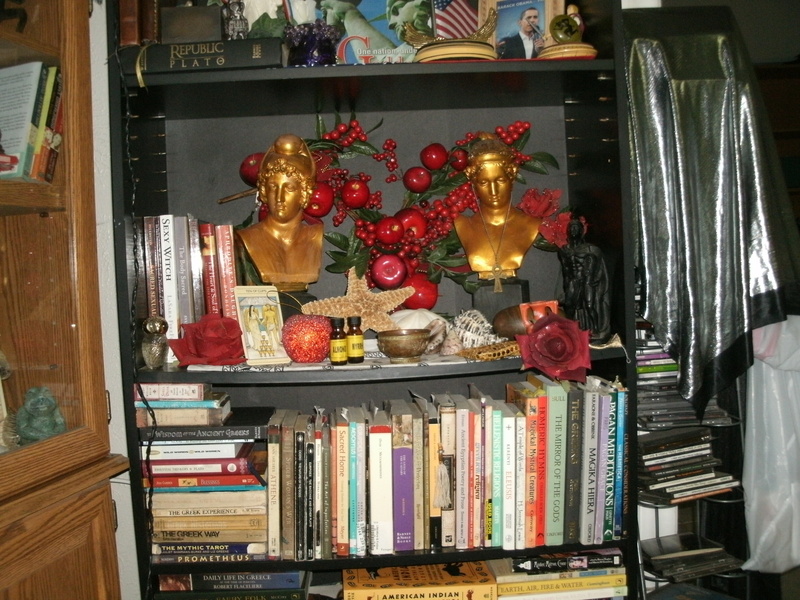 The middle shelf contains the National altar, featuring Hermes, Eirene, Libertas, Alexander the Great, and the daimon of President Obama, and Ares (only til war ends). Top shelves has BA books, Greek movies, a warrior woman statuette I use for Athena’s warrioress aspect, and a Xena postcard, fictional but a great Amazon archetypal figure! The Warrior Woman is a primarily archetype in my life. Here we have Aphrodite, the Goddess of Love, and her son Eros (Roman name Cupid). It’s decorated with a 10 of Cups tarot card depicting Eros and Psykhe, a gilded apple in remembrance of Troy, a star fish, sea shells and apple-laden branches in the back, all symbols of the Golden Goddess. Aphrodite is wearing an ankh, the Egyptian symbol of eternal life – it is only through the power of Aphrodite that all of us are born and come to live. Aphrodite was also one of the favored Gods of the Ptolemaic dynasty in Egypt. On the right side is a statue of a Hawaiian king who spoke to me of Ares, placed in front of a shiva lingum (male power) from the Ganges river in India. Ares is smaller than Aphrodite so that his power and strength will be used only in positive ways under the influence of his lover, the Lady of Love. National altar. Hermes foot, God of commerce and business, with small change of rare & foreign coins, 2 sm. round batteries (technology, communication), small owl handmade on a Navajo reservation – in honor of the Native Americans who were here first. Eirene (Peace) draped with a ribbon in red, white and blue. 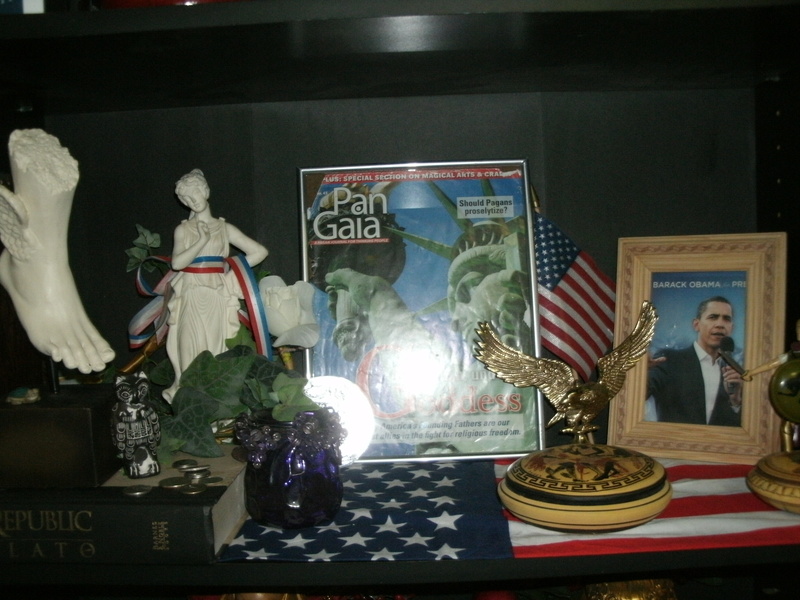 The center is a framed pic of Libertas (Roman Goddess of Freedom, now the Statue of Liberty) with the words “One Nation Under Goddess”, a gold eagle (symbol of both America, and Zeus, King of the Gods), Obama’s Agathos Daimon, Alexander the Great action figure. 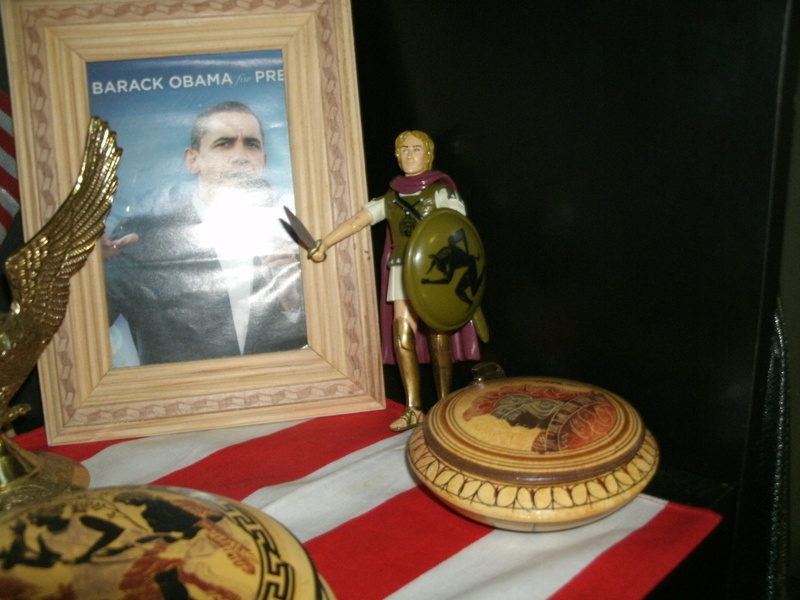 As long as we are at war, a small clay box adorned with the image of Ares sits here. It will be removed only when all our soldiers are home, until then I want Ares to protect our troops abroad. A better look at the Alexander the Great action figure. 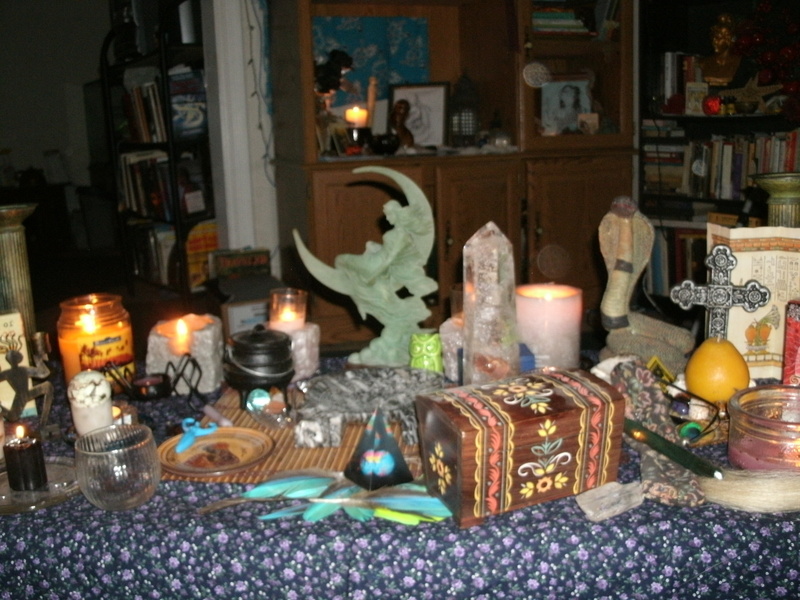 The coffee table in the middle of the room serves as a temporary altar to set up and change around for different festivals, celebrations, rituals, etc. Example of a Greek festival: Reconciliation of Hephaistos and Hera. Hephaistos is covered at the start of the ritual because He is absent from Olympos.